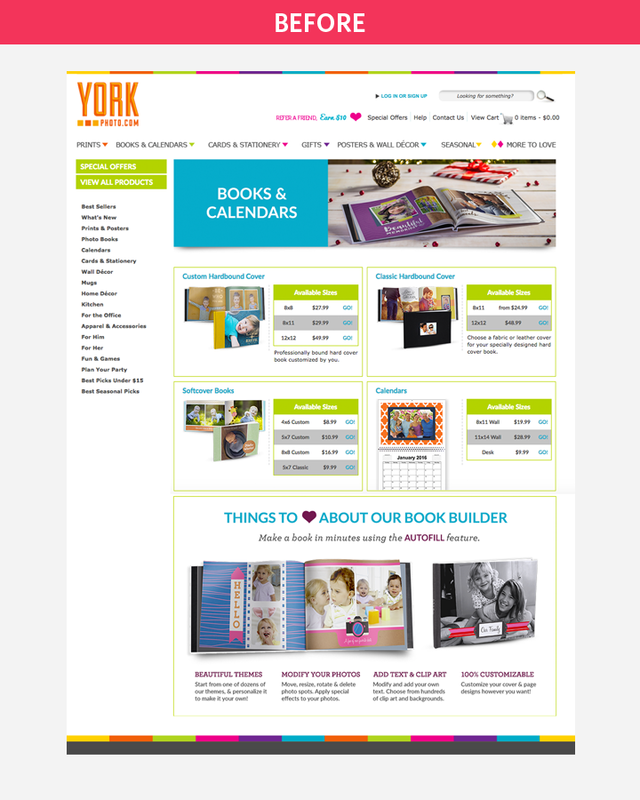 I led a redesign of the York Photo website, giving the brand a more refined feeling yet still retaining its fun and bold spirit. I changed the site layout to enhance the shopping experience, allowing customers to understand the product offerings better and to find what they are looking for more easily. I was responsible for both designing and coding the pages. Below are a few before and after images of the site. On the homepage, I created an area for large photos that show off the products and sales. I moved the frequently used buttons to the site header, but made sure they were still easy to find. 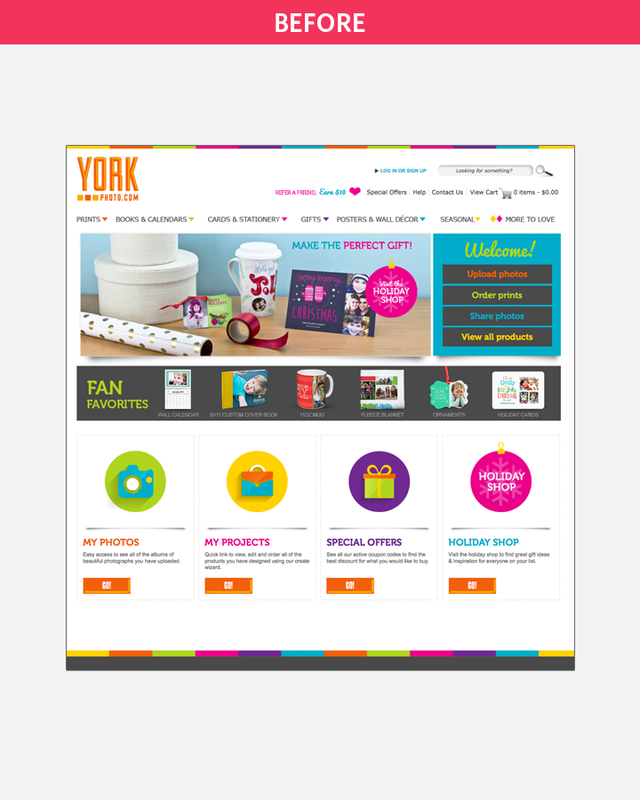 I added icons that explain what York Photo offers to its customers. 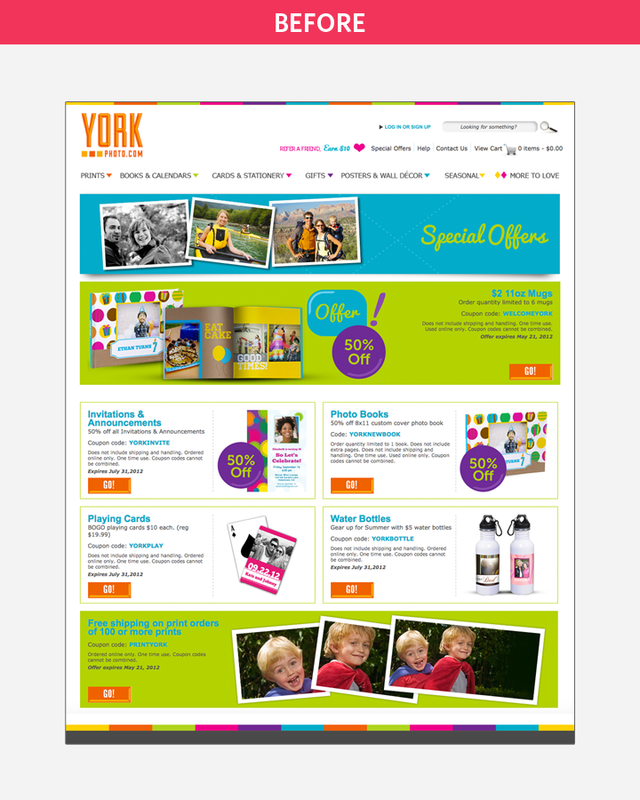 And in order to increase the customers' trust in York Photo, I incorporated a section for customer testimonials. On the books category page, I designed a more open layout and had new photos taken that show the differences between various styles of books. I restructured the left side navigation to refer to the photo book products rather than to the entire site's product offerings. Customers can now browse photo books by size or by style through the left side navigation. I redesigned the deals page to use larger, more consistently styled images. The ad information is written in larger text, which is easier for customers to read but is also structured in a way that is easier for the web content manager to edit and allows for more information to be added as needed.